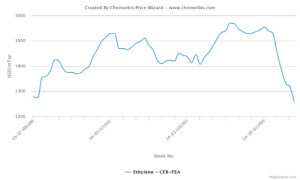 In Asia, the ethylene market is seen tracking a downward trend this week contrary to the gradual increases in spot propylene prices, according to ChemOrbis. Lower spot values were attributed to downward pressure from the supply side as producers started to boost production at their crackers in order to meet revived buying interest for propylene ahead of the Chinese New Year holiday amidst regionally tight availability for this product. 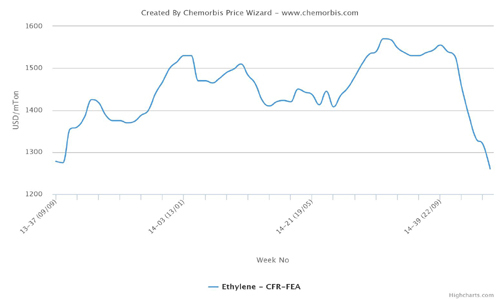 Spot ethylene prices declined by $20/ton in Northeast Asia and by $40/ton in Southeast Asia during this past week. After closing last week lower, spot prices lost further ground at the beginning of this week to break below a new threshold on a CFR Northeast Asia basis. Overall supply is said to be comfortable for ethylene due to cracker restarts and higher operating rates across the region. China’s Sichuan Petrochemical’s Pengzhou complex is in restart phase as of January 26, according to market sources. The company shut its 800,000 tons/year cracker and derivatives units for a scheduled maintenance on December 25, 2014. Taiwan’s CPC Corporation raised run rates at its No 4 and No 6 crackers in Linyuan from 85% earlier in the month to almost 100% at the end of last week in order to meet improved local demand for propylene. The company’s No 6 cracker can produce 720,000 tons/year of ethylene while its No 4 cracker has a capacity of 385,000 tons/year. South Korea’s YNCC is reportedly running its naphtha-based three crackers at full capacity. The company operates a 857,000 tons/year No 1 cracker, a 578,000 tons/year No 2 cracker and a 465,000 tons/year No 3 cracker in Yeosu. Another South Korean producer Lotte Chemical has also been running its two crackers at full rates since last week. The company has a 1 million tons/year naphtha cracker in Yeosu and a 1.07 million tons/year naphtha cracker in Daesan. Meanwhile, according to ChemOrbis daily headline, Taiwan’s Formosa Petrochemical is planning to raise run rates at its three Mailiao crackers to around 95% in February on the back of improved margins and better market conditions for propylene. The three crackers have a combined ethylene capacity of 2.93 million tons/year.